Todd: "The intention here was to use music to evoke the atmosphere of a number of hypothetical and highly unlikely cities; some which I might like to visit. Others not so much." Brought to you by Hidden Shoal and Tiny Room Records. 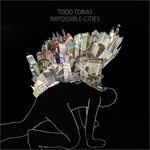 Original Tiny Room Records Release Info: We are very proud to release the second solo album by Todd Tobias, called Impossible Cities. It�s a beautiful, instrumental album full of atmospheric, eerie soundscapes and loud, crunchy guitars. Very cinematic, colorful and intense. It�s an album that�s very rewarding after repeated listening. If you open yourself to these inspiring sounds, it could change your way of thinking. Release date is October 28th, 2014. The cover artwork is made by David Crunelle.